Welcome to Dance Center of LaGrange! Please complete the following registration form. I agree to the non-refundable registration fee of $25.00 per family that will be charged at the time of registration. I give Dance Center of LaGrange permission to charge my credit card/bank account for the registration fee in addition to the class tuition fee(s). I am aware Dance Center of LaGrange will send me an invoice, via email, 10 days prior to the beginning of the upcoming session. If I wish to continue in the upcoming session, no action is required. I give Dance Center of LaGrange permission to charge my credit cards/bank account automatically on the tuition due date. A $10.00 late fee will be assessed for all tuition payments that are declined. No refunds are offered once tuition has been paid. No credit or refund will be given for missed classes. Classes must be made up within the same session. Those which fall on legal holidays must be made up in other scheduled classes. Finding an appropriate make-up class is the responsibility of the student. Dance Center of LaGrange reserves the right to cancel classes and will issue refunds in this case only. No other refunds will be given. I understand if any of my contact information should change, especially my email address, I will contact the studio to provide this new information for billing and mailing purposes. Dance Center of LaGrange does not send junk emails; if we send you an email, it is your responsibility to read it as it will pertain to your dancer and/or their class. As the legal parent or guardian, I release and hold harmless Dance Center of LaGrange, its owners and operators from any and all liability, claims, demands, and causes of action whatsoever, arising out of or related to any loss, damage, or injury, including death, that may be sustained by the participant while in or upon the premises or any premises under the control and supervision of Dance Center of LaGrange., its owners and operators or in route to or from any of said premises. 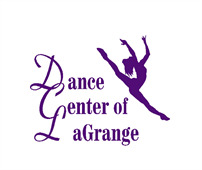 All images taken by the Dance Center of LaGrange are subject to use for advertising purposes without royalty. Parent/Guardian agreement constitutes the release of such photographs/videos.